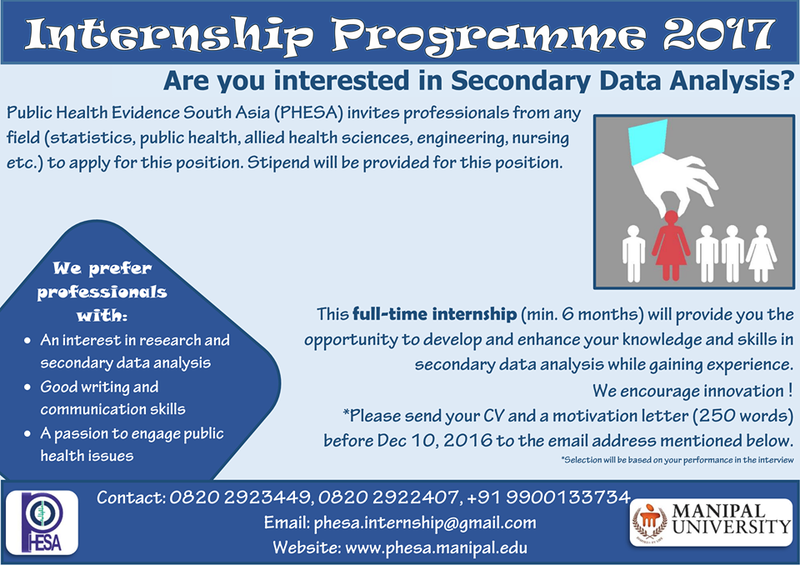 PHESA proposes to offer internship opportunity on different dynamic projects. Internships in our organization are a great way to learn and enhance your skills in evidence building, communicating , policy framing and getting an experience in various research methods. This will also open up an opportunity to interact and work with international organizations. Graduate/postgraduate students of any discipline (Allied health, sciences,medicine, dentistry, public health, nursing ,biostatistics, sociology, economics, arts, humanities, communication, management, engineering), well-organized ; able to complete tasks in a timely and efficient manner ,work well as both a team member and independently and professional-level of fluency in written and spoken English. Having analytical skill will be an added advantage. It is an ongoing programme, the first batch begins from July 1st. Interested candidates are requested to email your cv on ph.cochrane@manipal.edu. only selected students will be contacted for the interview.